"Nothing wrong with good old English piss." Profits at old gits pub chain JD Wetherspoon fell 19% in the six months to the end of January. 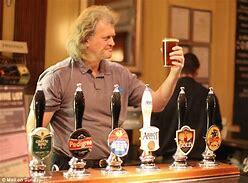 Wetherspoon's weirdo chairman, Brexit cheerleader Tim Martin, the last living proponent of the mullet, hairstyle of the gods, immediately announced that it is "Nothing to do with Brexit". Instead of Brexit, he blamed the fall in profits on a rise in labour costs due to a failure to recruit sufficient numbers of cheap Romanian and Croatian bar staff, rising utility bills from French owned EDF demanding payment in euros and repairs becoming more expensive as Polish builders leave the country. He also blamed the so-called "Metropolitan Elite" for boycotting his licensed premises after he refused to continue the sale of champagne and prosecco. He took to task "the establishment" for a "barrage of negative economic forecasts" and expressed concern that Brexit would be reversed. This, he said, would have "adverse economic consequences", such as a reverse in the decline of the value of sterling, a return of EU workers and give potential customers the confidence to go out and spend some of their hard earned money...Oops!